This most interesting and unusual surname is a rare patronymic form of the English name Abbott, which is either an occupational name for someone employed in the household of an abbot, or perhaps a nickname for a sanctimonious person thought to conduct himself like an abbot, from the Olde English pre 7th Century "abbod", Middle English "abbott", an abbot, plus the patronymic suffix "-s", son of. 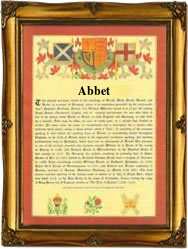 Variants of this surname include Abbatt, Abbett, Abbitt, Abbot, Abbots, Abbott, and Labbet. The surname itself first appears in records in the late 12th Century (see below), while other early examples include Walter Abat, who appears in the Assize Court Rolls of Yorkshire in 1219; Peter le Abbot, mentioned in Essex Records of 1237; and one Ralph Abbod, recorded in the Assize Court Rolls of Somerset in 1272. George Abbot (1562 - 1633) became Archbishop of Canterbury in 1611, while his brother, Sir Maurice (1565 - 1642) was lord mayor of London in 1638. Anthony, son of William and Amye Abbotts, was christened on August 15th 1653, at St. John's, Hackney, London. The Coat of Arms most associated with the family depicts on a silver shield a black cross fimbriated gold, between four black eagles displayed. The first recorded spelling of the family name is shown to be that of Walter Abbot, which was dated circa 1190, in "Documents illustrative of the Social and Economic History of the Danelaw", Lincolnshire, during the reign of King Richard 1, known as "Richard the Lionheart", 1189 - 1199. Surnames became necessary when governments introduced personal taxation. In England this was known as Poll Tax. Throughout the centuries, surnames in every country have continued to "develop" often leading to astonishing variants of the original spelling.